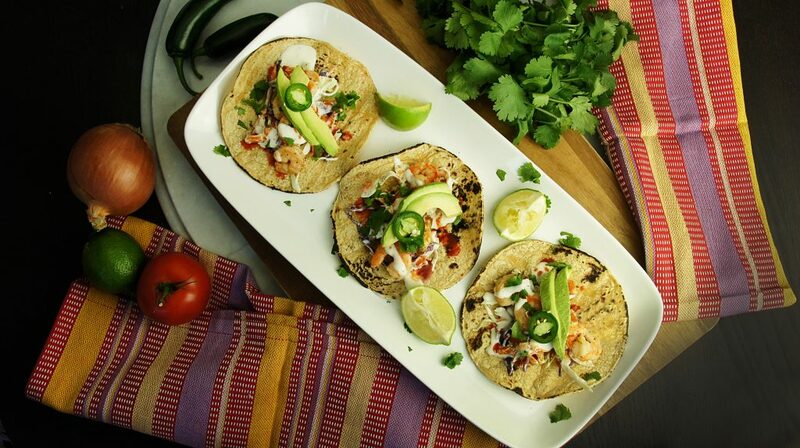 Finally the cold months are over, and it’s the perfect time to get whisked away on a little adventure in the kitchen with this fresh SoCal gluten-free Mexican food. Come take a big ol’ bite out of one of my favorite culinary landscapes: a bite out of SoCal Mexican food. Yes! Southern California is spoiled by not just fantastic weather year-round but also its culinary scene. Being only a stone’s throw away from Mexico, residents of this area are also spoiled by the most incredibly fresh Mexican food. This is different than the Mexican food you’re probably familiar with. This is fresh, light and vibrant! This tastes of the sea and really utilizes all that southern California has at its hands, with tons and tons of fresh seafood! If you can find it in the ocean, you can find it in a tortilla. The food here bursts with flavor—salty, citrusy, crisp, fresh. 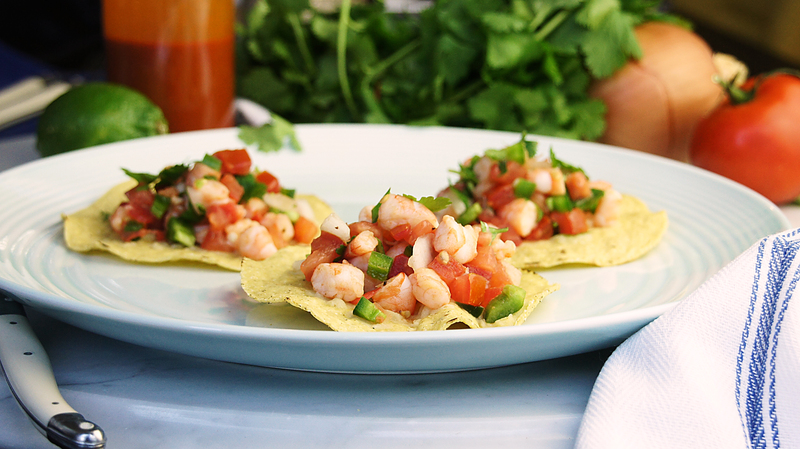 First up you have my Simple Shrimp Ceviche with Tostada. Simple, indeed. I took out the guessing work and perhaps some of the fear people have when you say you’re using raw seafood and only salt and citrus to “cook” that raw seafood. That can make some a bit nervous, so I’ve taken that fish fear out of the game, and we are using pre-cooked, peeled and de-veined shrimp. Obviously, if you have access to great local seafood, then by all means get some fresh shrimp and boil them yourself. If not, it’s perfectly fine to use a frozen variety that you thaw. Just be sure to roughly dice it into bite-sized pieces. The beauty of this dish is that because you are using pre-cooked shrimp, this ceviche needs hardly any time to marinate. Which means you can put this fantastically fresh dish together in minutes! Woohoo, total dinner victory. You should be able to find the tostadas at most grocery stores where you would find hard taco shells. These round fried corn tortillas have not yet been made into that lovely taco shape, which makes them a delicious foundation for toppings and more toppings. Get inspired and let your creativity go with these lil tostadas and top with anything you can dream of. I know this will become a fresh and favorite dish for your family. Click here for the recipe. Next up, you have my take on one of my most favorite things in the world to eat, which is very indigenous to southern California, the mighty fish taco. I just decided to keep my love of shrimp going with this dish and give you my Shrimp Tacos with Fresh Cilantro and Lime. The first time I had one of these beauties was back in 2002 at a beautiful, open beachfront restaurant in Mission Beach, San Diego. When I asked how fresh the seafood was….the surfer-looking waiter said, “Came in with a pulse this morning!” I’ll never forget that. Any of it! Just sitting there on the beach with all the shrimp taco goodness dripping down my arm, the waves crashing and my salt-kissed hair blowing in the breeze. Yep, life is truly delicious sometimes. The beauty of this dish is the simplicity and the fresh, clean flavors. These shrimp tacos are a true taste of So Cal Mexican cuisine, and I know you are going to love them! Click here for the recipe. Finally you have another true San Diegan favorite, which I’ve done a much healthier take on, my Healthy’d Up Carne Asada Fries with Avocado Salsa. 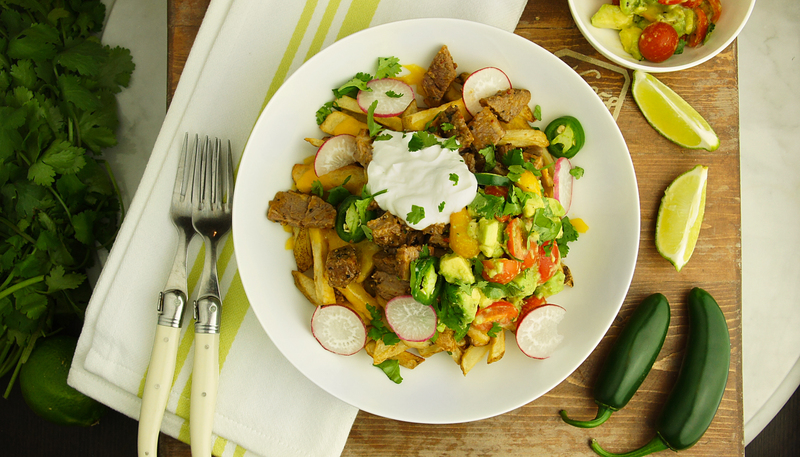 You’re probably wondering, “What in the world are carne asada fries?” The short answer…heaven! Especially for us gluten-free folk! They’re basically everything inside a California burrito turned inside out, so French fries, carne asada meat, melty gooey cheese, sour cream, guacamole and tons of hot sauce! Think of this as the best nachos you’ve ever had…because instead of some boring old tortilla chip…you use FRENCH FRIES! Boom, life changed forever, and, yes, you are welcome. More and more, I see pre-made carne asada meat available at most grocery stores. Trader Joe’s and Whole Foods both have a fantastic one that is gluten free, but do check your local stores in the meat section to see what they have on offer. Even Costco has been carrying it. If for some reason you have a hard time, feel free to substitute any other steak, meat or protein you might prefer. You don’t need too much for this dish. Try making this San Diegan favorite for your next big game, and get ready to be asked for seconds. You can always substitute sweet potato fries for regular to help lighten it up even more. Click here for the recipe. I so hope you try this for yourselves and enjoy!